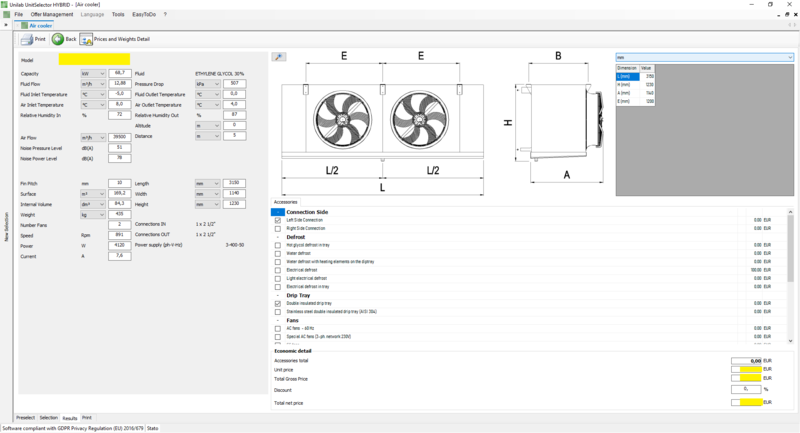 The best solution for the selection & estimation of Dry Coolers, Aircoolers, Remote Condensers, Unit Coolers & Static Evaporators! 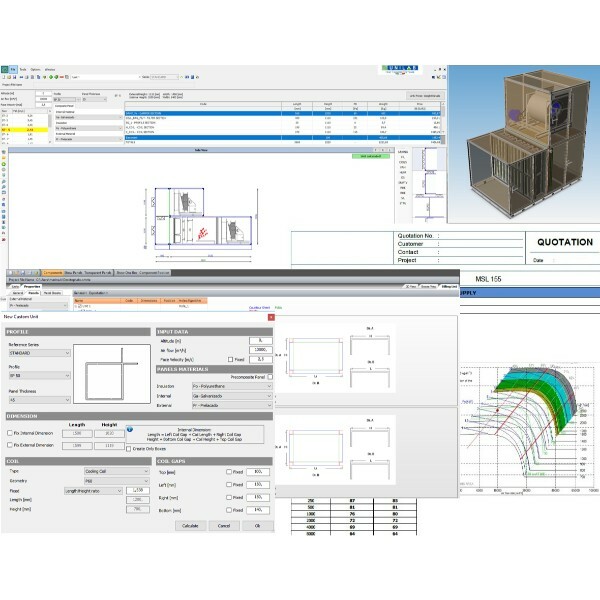 The software allows to make in a quick and accurate way the selection and estimation of unit coolers, air coolers, dry coolers, remote condensers & static evaporators. 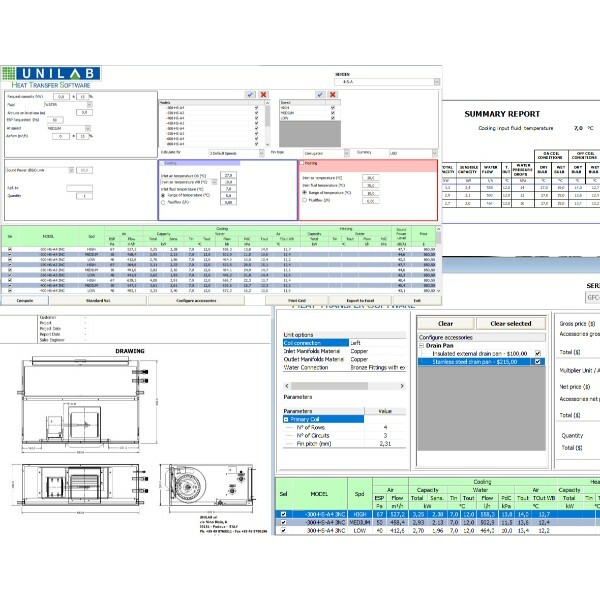 These units can be analyzed at various calculation modalities (direct expansion, pump evaporator, cooling, condensing and heating), allowing you to work both in selection and in verify mode. 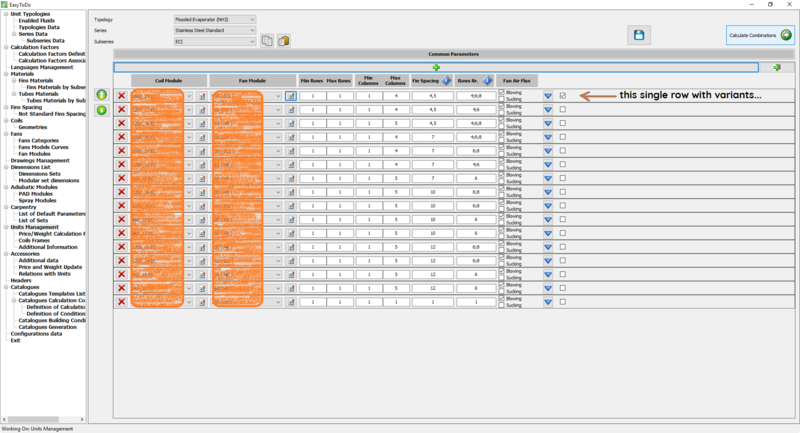 In selection, the user can select a range of units, while in verify mode the user focuses on a single unit. 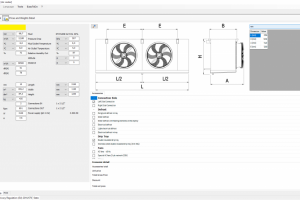 During the calculation, it is possible to force the software to always use the nominal air flow, or the fan balance point. 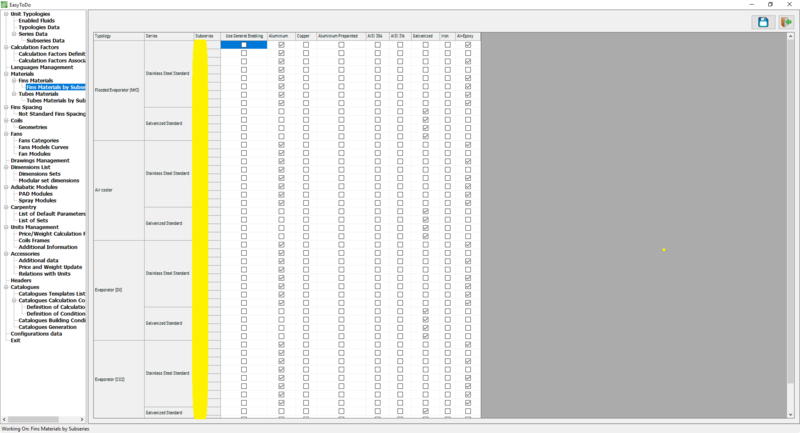 Furthermore, the calculation of the number of circuits can be done automatically. 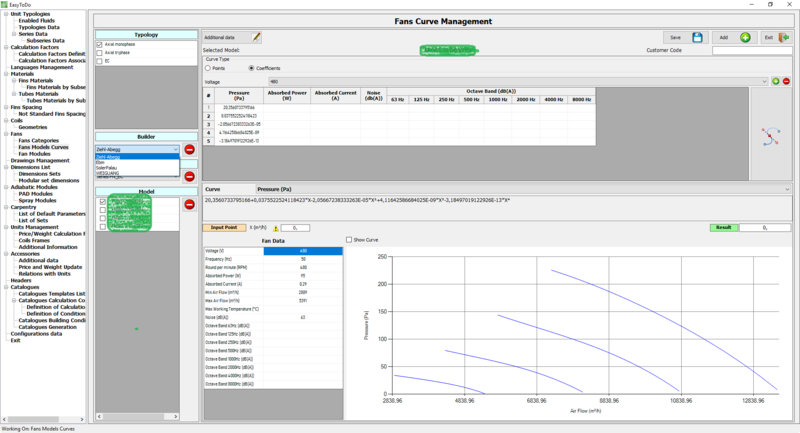 It is also possible to calculate the noise from the fan curve. 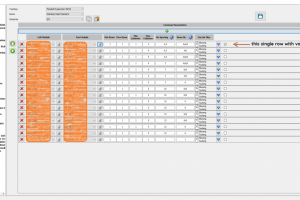 There is also the possibility to insert an automatic calculation of the connections. 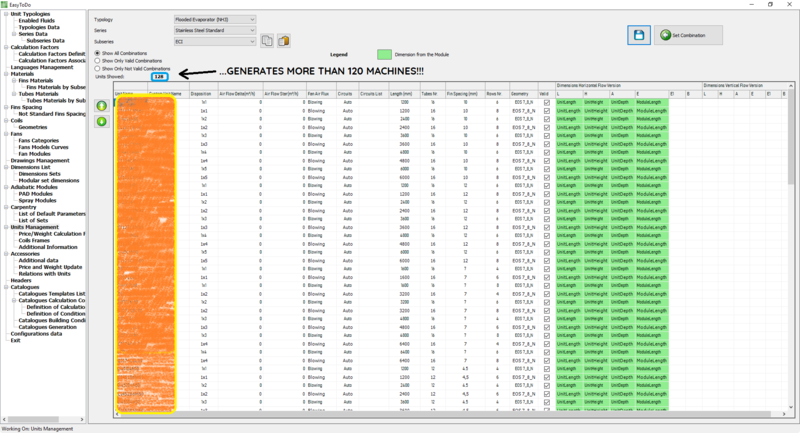 Your units can be easily generated from a library of precomposed modules. Module means the insertion of a ventilation section (one or more fans), a finned pack heat exchanger section (one or more coils) and an additional section comprising the carpentry. 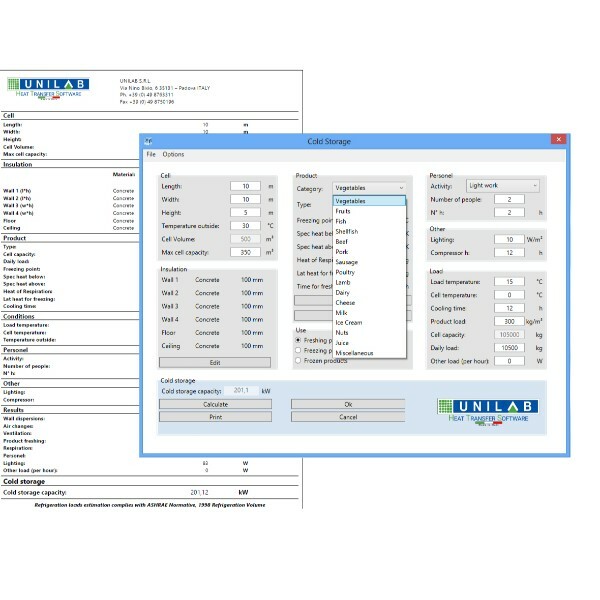 During the calculation, the software will create the units automatically, using the preloaded modules and generation rules. 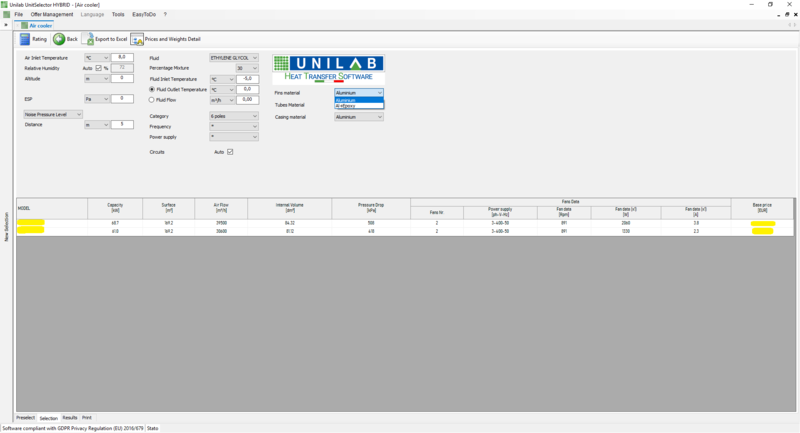 By generation rules, UNILAB intends all the information needed to create the unit starting from a module. 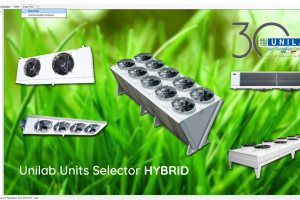 HYBRID contains the thermodynamic properties from the REFPROP library, including the new refrigerants like R1234yf, R1234ze, R449A, R32 & more. 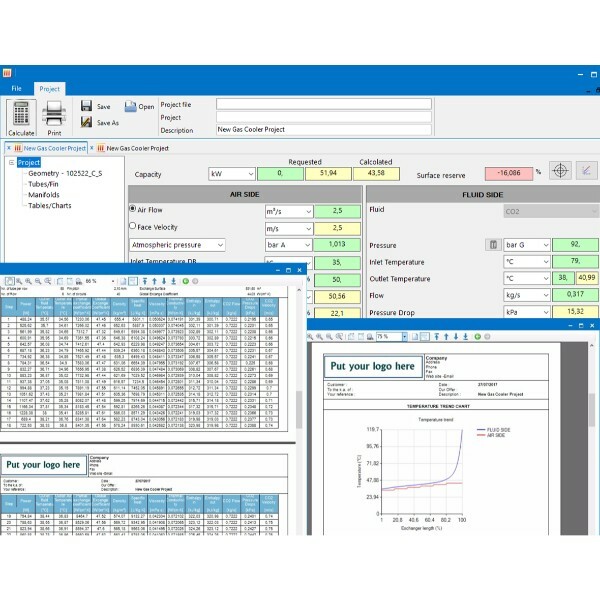 The creation of new ranges of units is very intuitive with the EASY TO DO tool, where you can easily create new models, also compatible with the newest refrigerants. 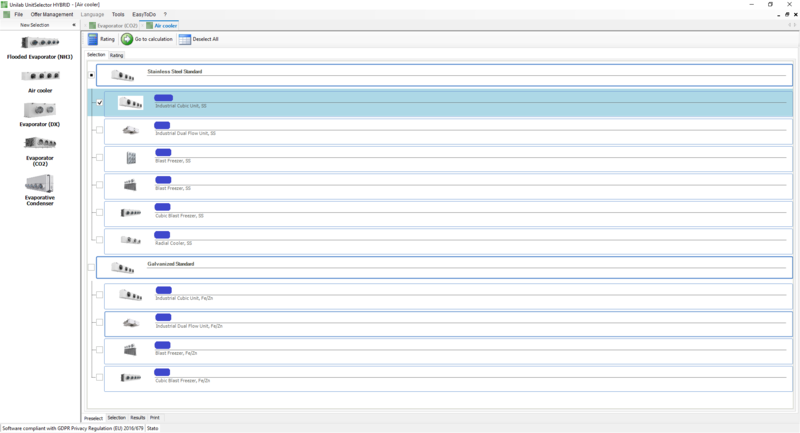 New units ranges, created with the same module logic and differing for a few elements only (e.g. fin material, fin pitch, etc. 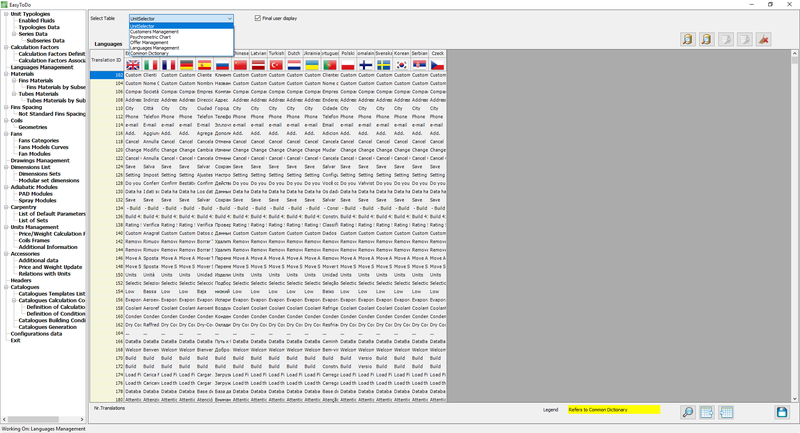 ), can be rapidly replicated in one click, just changing few parameters. 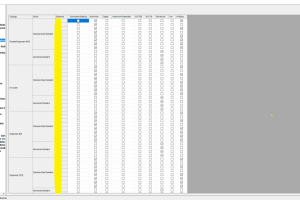 This means, in a simple way, that you can load just a few data for an entire series of machines, thus saving time in data entry, management and maintenance of the program. 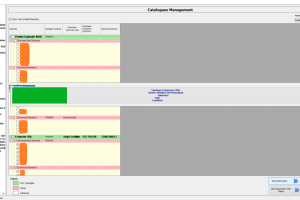 Creation of catalogues with performance tables is also a great feature included in EASY TO DO! 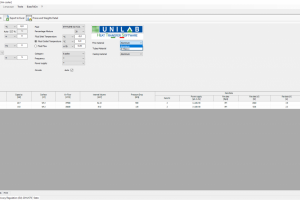 UNIT SELECTOR HYBRID is the tool recommended by Unilab for HVAC companies which need to select and estimate dry coolers, air coolers, remote condensers, unit coolers & static evaporators. Available in the following calculation modalities: heating, cooling, condensing, direct expansion and pump evaporators. 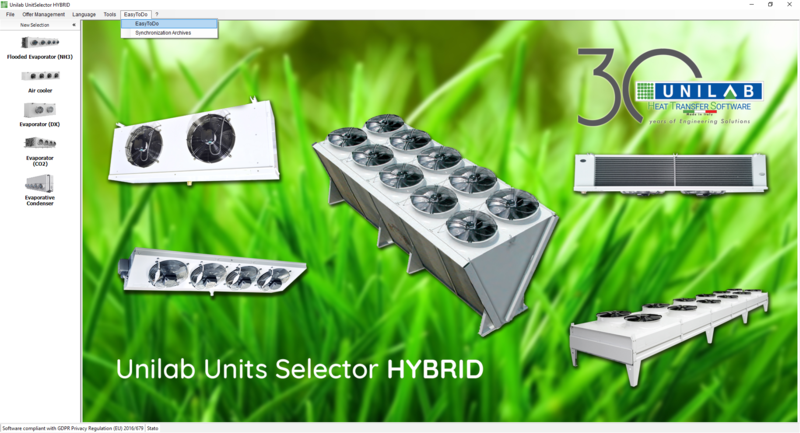 Because HYBRID allows you to carry out a wide range of operations. 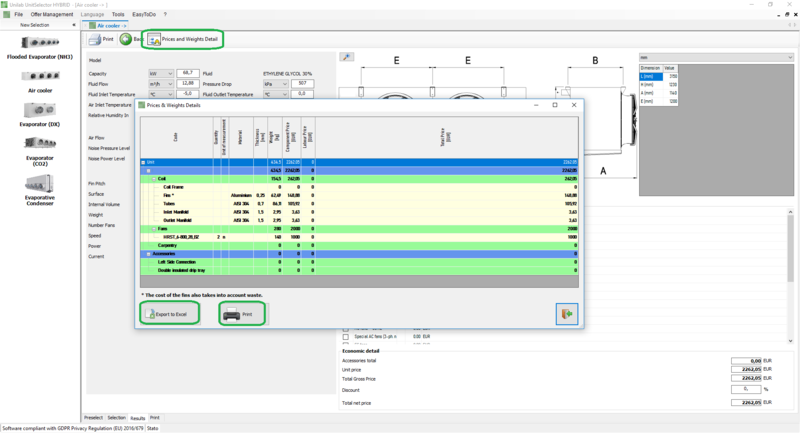 For example, UNIT SELECTOR HYBRID is able to perform a selection within specified positive and negative tolerance margins and to calculate the noise directly from the fan curve. 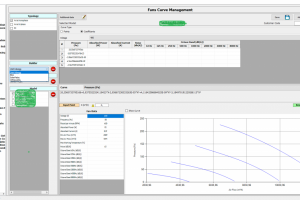 Thanks to HYBRID you can balance the program with the fan curve or with the nominal airflow and you may also calculate NH3 units. 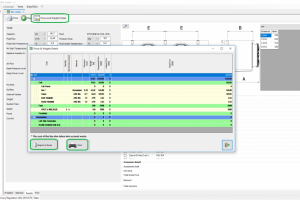 The calculation of the exchanger design uses our highly accurate software COILS. 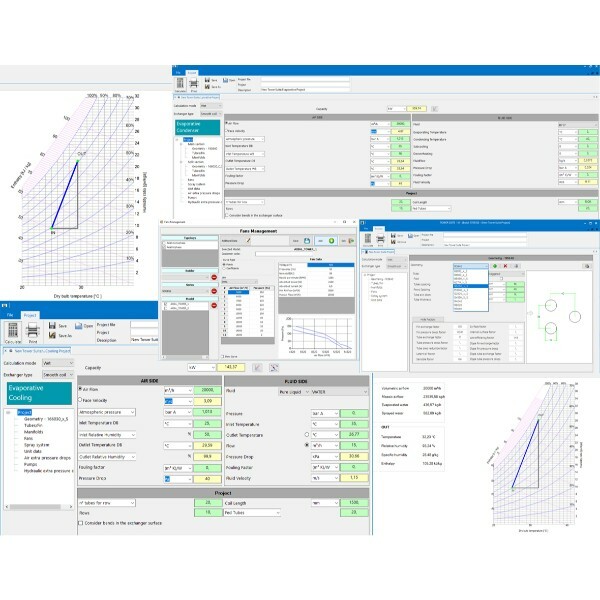 The EASY to do tool, for the creation of new modules, allows you to insert, set, edit and erase materials, dimensions, prices, weights, other information like geometries, coils, fans, units (series, sub series, typologies), accessories and relationships unit-accessories, drawings and images, and to create catalogues with performance tables! 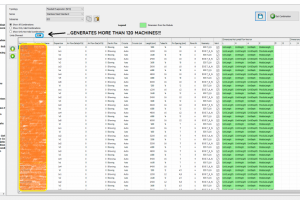 With modules, you can load just one line of data combination to create an entire series of over 120 machines! 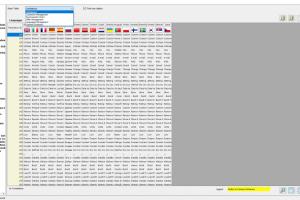 Database is much lighter, allowing you to SPEED UP selection! 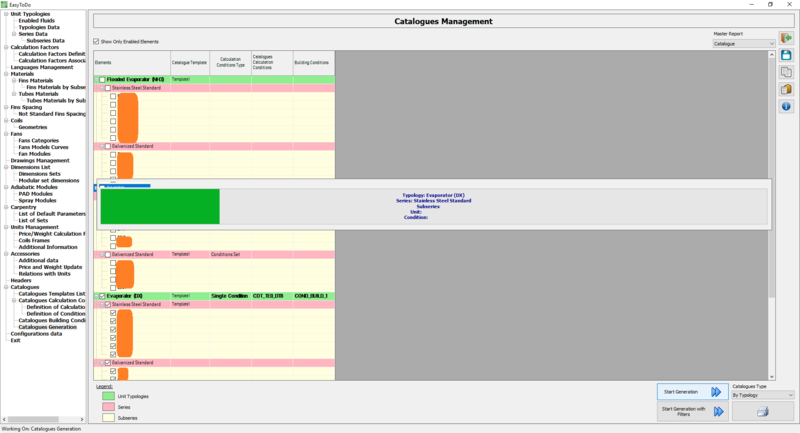 Design new series and export your catalogues in a few seconds! 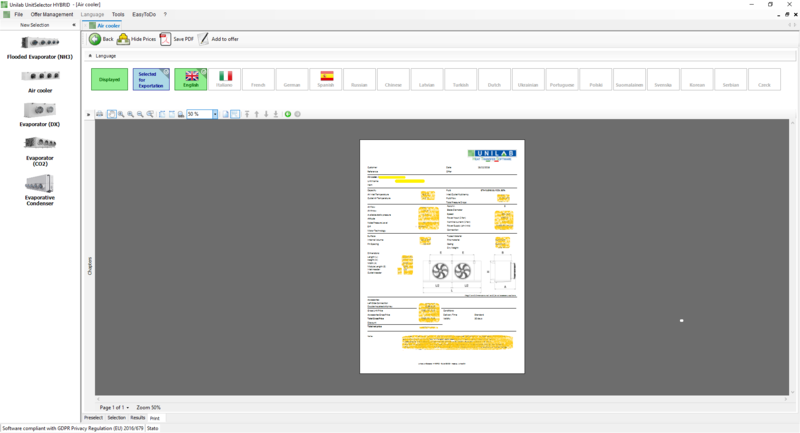 (ON DEMAND) Create new offers which can be edited, saved and stored in a progressive archive for easy reference. 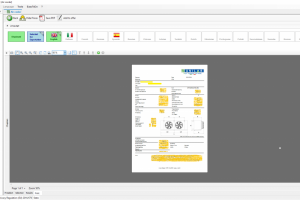 (ON DEMAND) Adiabatic system, customized multi-language printouts! 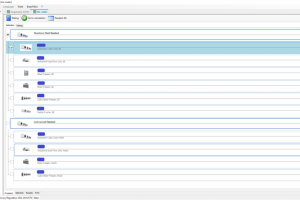 (ON DEMAND) Auto Debug tool! for the Transcritical calculation of Co2 Gas Coolers.